Written by Marina Pape on October 26, 2017 Blog, Customer stories. Doug Smith, his wife Karen, and their good friends John and Sonya Shafer had been homeschooling when friends began asking questions about how they were doing it. Joining forces, they started a blog to make it easy to share their learnings. At the time, the Smiths lived in Illinois and the Shafers lived in Georgia, so Simply Charlotte Mason actually started as a virtual company (like Automattic). 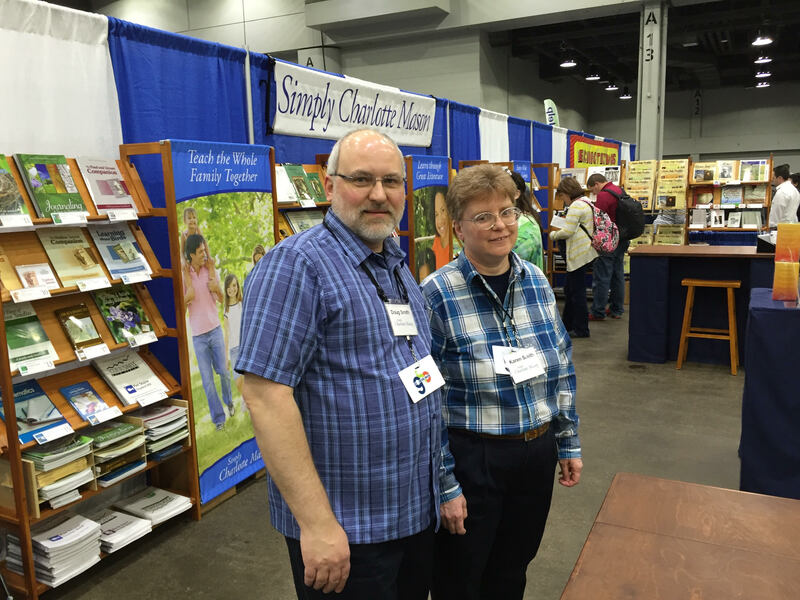 Doug and his wife, Karen, in their booth at a homeschool convention. In light of the blog’s success, their next step was to build a fuller website to house their growing library of resources. They named the site after Charlotte Mason, whose approach and materials — updated for a modern educational context — informed much of their own curriculum and methods. From the site’s earliest days, they engaged in user research, talking to the homeschooling community about their needs. This included a survey from which they started building a mailing list. Simply Charlotte Mason (SCM) has now been running for twelve years, and the team behind the operations is a mix of family hires (including the founders’ own children! ), employees, and contractors. The friends had a lucky blend of skillsets — including IT, early education, publishing, and writing — took their varied experiences, and dived in. Doug noted that they were all good at knowing how to research and teach themselves new skills, something critical for most business owners and an important piece of the homeschooling philosophy: be a self-learner. The SCM team is currently at five full-time and four part-time staff, plus nine or so curriculum contractors that create materials for them. They also work with other contractors and have partners in other businesses — including from their local community. Sonya Shafer is the main face of the organization and does most of the company’s speaking and writing, while Doug remains the lead on technology and the website. Early on, they established a relationship with the local shipping store, Pakmail, which came on board as a fulfilment partner. What started as a few shelves for about ten products is now a whole room with floor-to-ceiling cubbies filled with SCM products. A Pakmail employees picking products for an order. 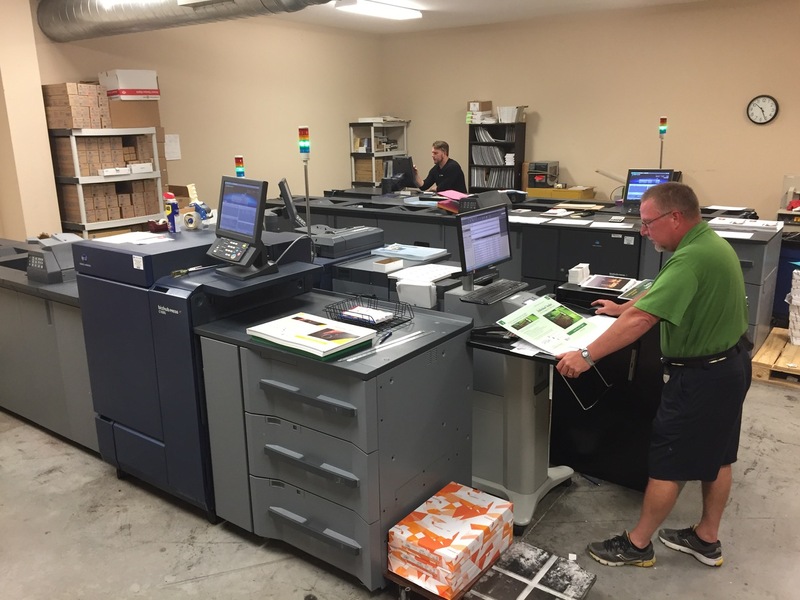 They also have a close working relationship with the local printer, who is happy to do small print runs and produces most of their resources. The printer delivers the materials directly to the Pakmail store for storage or shipping. The local printshop owner, checking up on a book cover. SCM orders generate a significant portion of the revenue of these two businesses, and Doug is understandably proud that they’ve been able to support other small businesses in the Atlanta suburbs. Kudos! 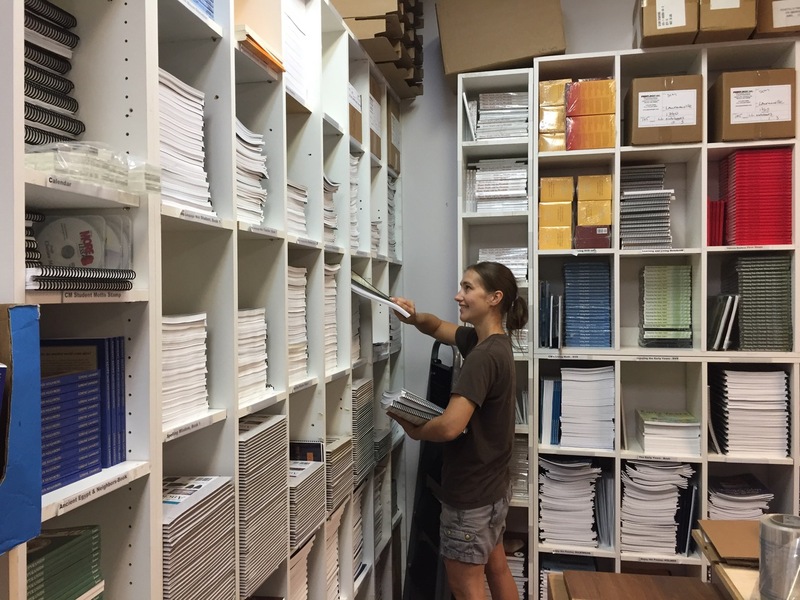 Today the SCM store has around 200+ SKUs and offers more than just books — products include parent training videos, live conferences, audio recordings of workshops, and more. Almost everything they produce is available digitally as ebooks, but the majority of their orders are for the physical versions. They experience significant seasonal spikes and see hundreds of orders (products shipped or downloaded) per week at peak times. Peak season for homeschooling is when parents are planning for the new school year, which makes August the business’s busiest month. The team attends conventions across the US, and travels to do in-person workshops and sales during spring each year. I loved hearing more about Doug’s journey with WordPress and WooCommerce. There is a wonderful philosophy of self-education that underpins the business that’s a perfect fit for WordPress and WooCommerce: the WordPress ecosystem is founded on self-learning, too. The need for eCommerce capability on WordPress arose when the team wanted to sell more products and physical books. He was an early adopter of WooCommerce, installing it just months after it was released in 2011! He remains an active part of the wider WordPress and WooCommerce communities and attended all three WooConfs — in 2014, 2016, and just last week in Seattle. His passion for open source is infectious and got me excited about what sets WooCommerce apart all over again. VaultPress: Gives SCM peace of mind with real-time backupsw and security scanning. share help each other with homeschooling ideas and solutions. Gravity forms: Used for all sorts of forms on the site, especially the contact form that adapts to collect the information needed to solve problems without a lot of back and forth. WooCommerce Search for WooCommerce: Speeds up product searches and returns better search results. PowerPress podcasting: Adds podcasting feeds and embeds to the site. CF Expiring Content Shortcode: Adds sale notices in product descriptions and posts that disappear after a certain date. Yoast SEO and Yoast WooCommerce SEO: Adds SEO features with specifics for products. WP Rocket: Improves page load times with image caching that plays well with WooCommerce. WP Sent Mail: Logs emails for troubleshooting and resending. wpMandrill: Takes a load off the server by routing order and customer notification emails through their service. I was curious about Doug’s experience with hosting — over time as their needs have changed, they have changed hosts. At this point they are with Liquid Web on a dedicated server, but are always on the lookout for different options. Amazon S3 Storage: Handles delivery of downloadable items. WooCommerce Composite products and WooCommerce Product Bundles: Presents products in creative groups and bundles, usually for better clarity of a family of product. WooCommerce Dynamic pricing: Creates offers and discounts for specific groups of people, like bulk purchasers). Subscriptions: Sells subscriptions to an online planner and scheduler and integrate with it through the REST API. Stripe: Adds credit card payment processing. Google Analytics: Integrates sales data into web stats. WooCommerce Gravity Forms Product Add-ons: Adds the ability to create custom forms for making product selections or collecting needed information. Order Status Manager: Adds extra order statuses to match the company workflow. Shipment Tracking: Adds tracking numbers and automatically sends them to customers with a ship notification. URL Coupons: Removes the coupon fields so customers don’t abandon their cart to search for coupons, and allows coupons to be used by a URL instead. Amazon S3 Storage, in particular, solved a lot of problems for SCM — before switching to this service for ebook delivery, they had a number of errors and customers contacting them regularly about damaged files. They realized this was due to timeouts, especially on slow connections. Adding this extension drastically reduced errors and the resulting strain on support. Now, their files are delivered with no problems. WooCommerce Gravity Forms Products Add-ons has been useful on their WooCommerce product pages for event registrations. They used the extension to create forms that collect extra registration information. For example, they might let someone choose if they are attending one or both days, capture their name and city for a name tag, choose if attending with a spouse, etc. Help Scout is for customer communication. SCM has a contact form that collects the specific information needed for help with an order. That feeds into Help Scout, where the SCM team can collaborate on helping and answering. Something Doug loves about Help Scout is the WooCommerce extension that displays order and account information in the Help Scout sidebar when they view messages from customers. It also integrates with MailChimp, and shows what lists that customer is subscribed to. The SCM team send their weekly blog posts as an email through MailChimp. MailChimp also integrates well with WooCommerce, which can pass along order and customer data so messages can be automated based on sales information. For example, if you purchased a grade one curriculum last year, SCM might send a note letting you know that grade two is available. Xero is a cloud-based accounting system that integrates with WooCommerce so sales data can be passed into it automatically. Fun fact: Doug reckons simplycharlottemason.com might be the first homeschool curriculum vendor to take Bitcoin (and then Apple Pay), thank to the WooCommerce Stripe plugin. Woo! Read more about Apple Pay for WooCommerce. The thing that makes WooCommerce unique is it’s flexibility, openness, and extensibility — so we sure love it when folks make the most of this to build creative, custom tools. 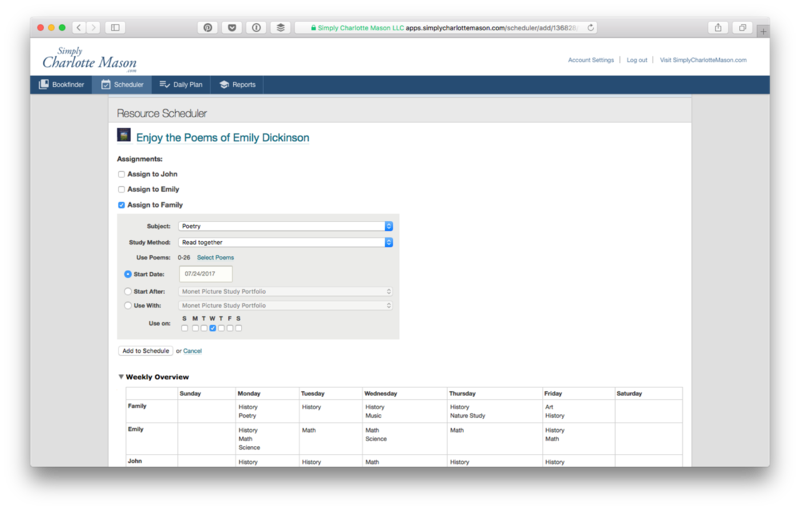 The SCM team built a scheduling and planning app for simplycharlottemason.com using the Ruby on Rails programming language. This curriculum builder tool, the CM Organizer, helps people organize, schedule, and record how they will use various books and resources — essentially building out a lesson plan they can stick to. Then, WooCommerce Subscriptions and the REST API hook the curriculum builder tool into the main store, enabling SCM to sell subscriptions to it. Neat! My lasting impressions from chatting with Doug is that SCM is not just a bookstore, and its mission is about a lot more than the bottom line. Their vision is to pass down knowledge, build local community, and build family. They pour energy and resources into building trust and interacting with the community. With determination and hard work over the past 12 years, these two families have found a sustainable way to pass on what they know to others. 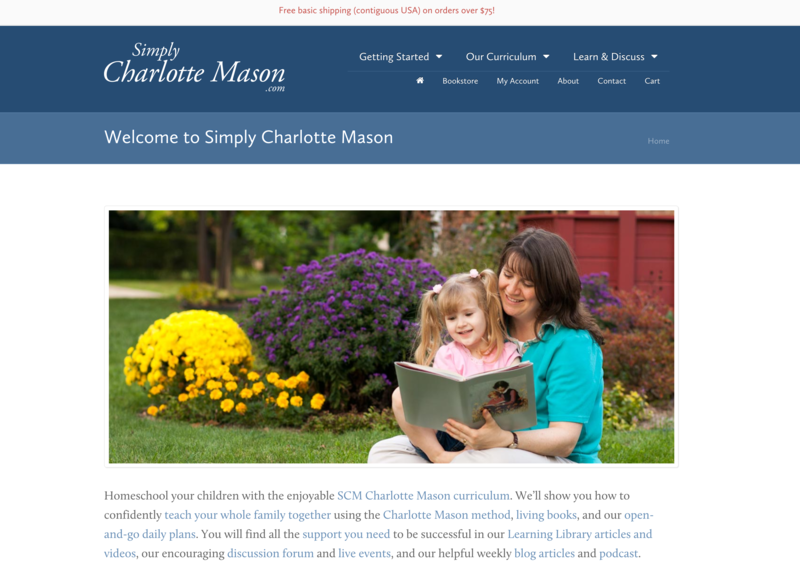 Simply Charlotte Mason is a community, way of life, and way of thinking. And I am proud as punch that it runs on WooCommerce. If you have any questions for Doug, I’m sure he’d be happy to answer them in the comments. Get connected. Doug shared how much he has learned from the WordPress and WooCommerce communities and from Woo documentation. Build what you enjoy. Much of what he builds is based on his own experience of shopping online and what he likes. If he finds something frustrating, he will be sure to avoid the same mistakes in his own store. Leverage content across media. As a small team, they all wear many hats and have found that re-purposing content across media is a smart way to ease the burden of constant content production. They are always looking for ways to re-use pieces and turn them into different formats for people to consume where the prefer. Recently they’ve found podcasts to be very popular in the homeschool community. Great read! Though we are not a bookstore, but the article has valuable insights that we will be using in our model. Your posted blog is really very attractive and valuable post for us. And I got the best idea by your post. and I will visit here again. url coupons extension is a very valuable extension. I love yoast extension as well as it helps in producing search friendly urls. Thank you for sharing your story with SCM! Your site is extremely fast. It’s mentioned that you use LiquidWeb – what hosting package and specifications are you using to make the site so speedy to load and navigate? Are you also using any external CDN or site cache (CloudFlare, etc.)? Thanks for whatever additional insight you can share. We are planning to start an online bookstore. We planned to start it with opencart. But I have changed my mind. I’ll start it with woocommerce for sure.